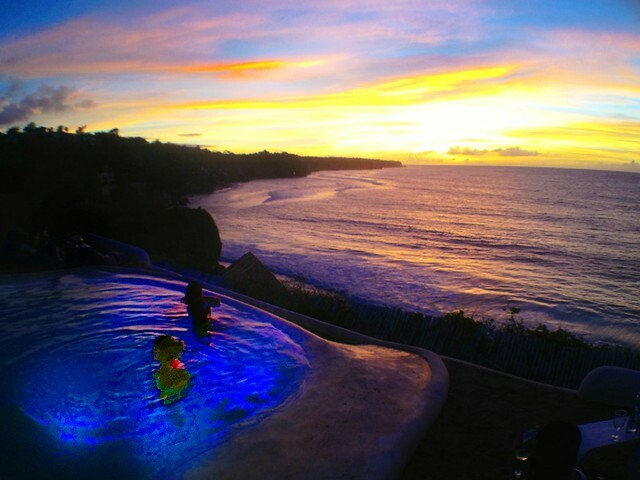 Probably not so "secret" any more, these are Bali's Top 10 Secrets according to Bali Secrets from Deck of Secrets. For anyone interested in trying traditional Balinese cuisine, a trip to Bali Asli restaurant is a must. Owned and operated by an executive chef who once trained alongside Gordon Ramsay at London's Savoy Hotel, Bali Asli is a culinary treasure tucked away in the East Bali countryside. Dishes are prepared in the traditional way, without the use of electrical appliances, and using ingredients bought at the local market or from the restaurant's own gardens. The restaurant also offers a unique cooking school that offers an insight into Balinese culture and cuisine, and often takes students into traditional markets or on board local fishing boats to gather ingredients to be used in class. A day trip to Karangasem could also include a visit to Tirta Gangga, a beautiful water palace that features a maze of pools and fountains surrounded by a lush garden with stone carvings and statues. A little piece of Ibiza can be found perched on the cliffs of Bali's Bukit Peninsula, at El Kabron. With endless ocean views, this Spanish-style restaurant is the perfect place to enjoy a sunset beer after a day of surf. Sit back and relax in one of the comfy bean bags or take a dip in the infinity pool to cool off. Popular Spanish dishes include seafood paella, tapas, and crema catalonia, washed down with a glass of Sangria, of course. 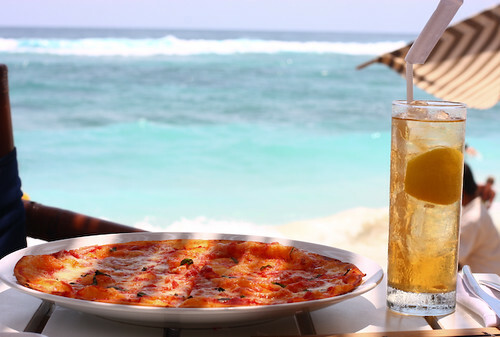 The original "bean bag beach bar" on the Seminyak strip, La Plancha is a firm favorite for good reason. Colorful umbrellas, beach shack decor and laid back acoustic sets makes this the ideal spot to people watch and take in the sunset. La Plancha has also recently become known for its lively beach parties, usually held once or twice a month or on Full Moon and New Moon nights. The parties attract both locals and tourists alike, and carry on well into the early hours of the morning. 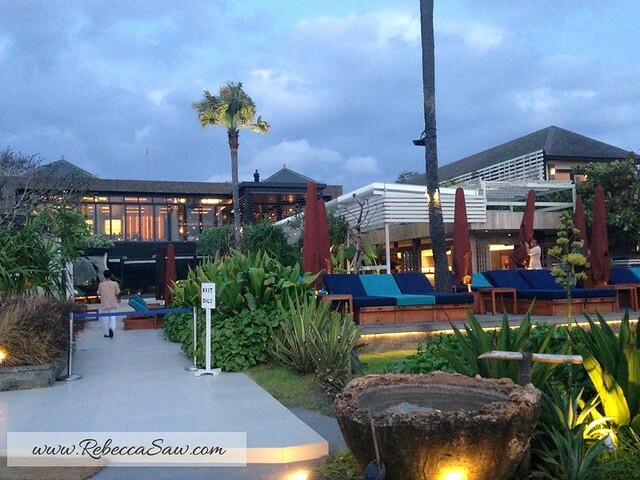 For a spot of beachfront fine dining, head to Mozaic Beach Club in Batu Belig. With seating for over 200 people in a casual poolside bistro and a more formal upstairs dining room, Mozaic is perfectly located just a few minutes from Seminyak. Mozaic Beach Club is a spin-off of the popular Mozaic restaurant in Ubud, which was recently rated as the best restaurant on the island in The Miele Asian restaurant guide. Nammos Beach Club is part of the luxury Karma Kendara resort, located in Ungasan on the Bukit Peninsula. Access down to the private beach is via a funicular, with views of the white sand beach and azure waters below. Spend the day being waited on hand and foot, indulge in a relaxing massage, and enjoy one of the many Mediterranean dishes available while soaking up the sun. Nammos is also super family friendly, and offers a range of water activities for the kids. Petitenget is conveniently located as a pit-stop along the popular shopping strip in Seminyak. Take a break from hitting the boutiques and have a bite to eat at this stylish Mediterranean-style cafe. Salads feature delicious ingredients like honey roasted beets, goat cheese, and hazelnut. The coffee is some of the best on the island too. Potato Head is a treat for both design-lovers and beach-lovers. With thousands of antique shutters creating an impressive if not quirky entrance, this is the place to be seen in trendy Seminyak. Cocktails are the order of the day at Potato Head, served poolside or at the bar. Potato Head Bistro serves comfort food inspired by international home cooked recipes. On the other hand, Lilin offers a tapas selection of South East Asian cuisine and choices of exotic live seafood as its main highlight. Fivelements, Banjar Baturning, Mambal The stunning Sakti Dining Room may be a bit of a trek to get to, but it's well worth the effort. 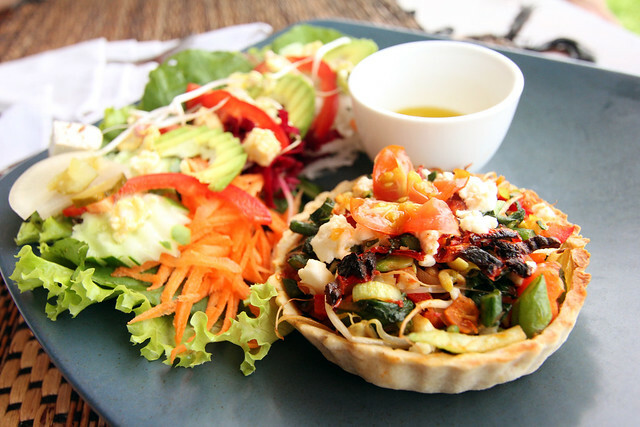 Located in the Fivelements resort's eco-luxurious grounds, over half of the selections here are raw vegan dishes, while the remaining dishes on the menu are gourmet vegetarian delights. Alcohol and caffeine are off limits, however they still manage to offer 3, 5 and 7-course menus. For a typical relaxed Balinese dining experience with endless rice field views, lunch at Sari Organik is a must. 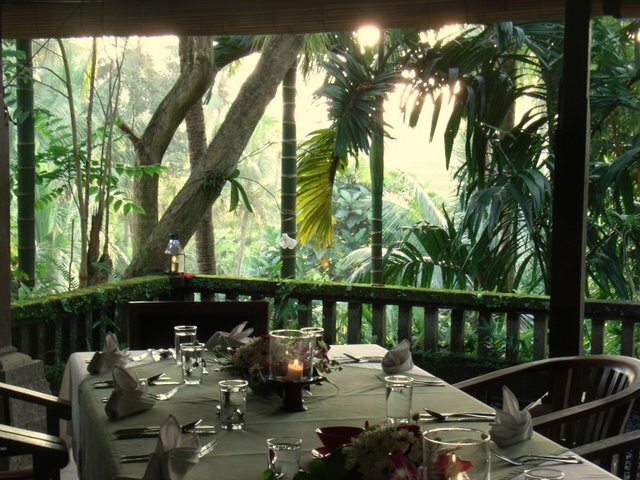 The restaurant is part of the Sari Organik Center that is leading the current organic movement in Ubud. Guests can explore the farm, which also produces jams, homemade wines and cheese, and most of the ingredients used in the cafe come straight out of their very own garden. The best part of Sari Organik is getting there - a 15 minute walk through the rural countryside. This hip and happening boutique coffee studio will be a hit with all lovers of good coffee. 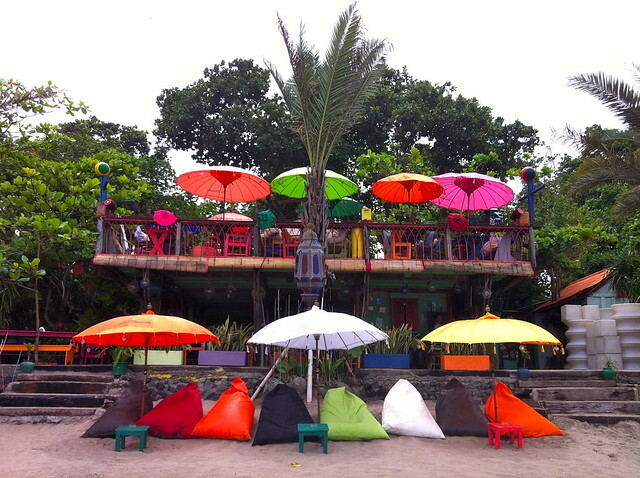 Seniman means "artist" in Indonesian and this funky café celebrates the art of coffee making. There's nothing like "coffee to go" in this place; it's all about taking the time to sit back and relax while waiting for a quality cup of slow brewed coffee and simply soaking up the atmosphere.